Geothermal heating and cooling systems use the natural constant ambient temperature of the earth to heat in the winter and cool in the summer. 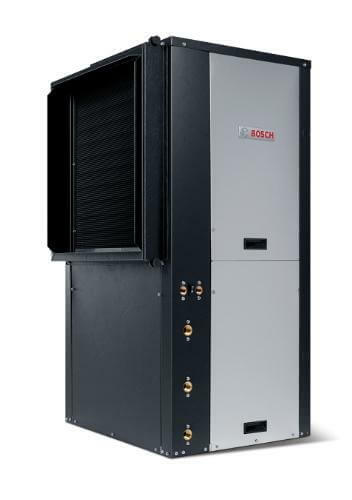 This is accomplished with a compressor or heat pump unit, the liquid heat exchanger medium, and the air delivery system. Quite simply, geothermal systems in heating take heat from the earth, transfer that heat to a refrigerant, then distribute the heat into the structure with a forced-air or hydronic system. In cooling, geothermal systems take heat from the structure, transfer the heat to the refrigerant, then transfer the heat back to the water or loop fluid. This works the same as a standard air conditioner, except a geothermal system uses water or loop fluid at a constant temperature (average 50 degrees) instead of varying outdoor temperature. In other words, it’s like heating and cooling your home when it’s 50 degrees outside – all year! Studies show that approximately 70 percent of the energy used in a geothermal heat pump system is renewable energy from the ground. The earth's constant temperature is what makes geothermal heat pumps one of the most efficient, comfortable, and quiet heating and cooling technologies available today. While they may be more costly to install initially than regular heat pumps, they can produce markedly lower energy bills - 30 percent to 40 percent lower, according to estimates from the U.S. Environmental Protection Agency, who now includes geothermal heat pumps in the types of products rated in the EnergyStar program. Because they are mechanically simple and outside parts of the system are below ground and protected from the weather, maintenance costs are often lower as well. Another feature on most geothermal systems is a Hot Water Generator or a desuperheater. Desuperheater's, take refrigerant from the compressor, where it is very hot, and directs it to another small heat exchanger. In this heat exchanger, water from a standard domestic hot water tank flows through, picking up heat from the hot refrigerant. This heat exchanger is double-walled, and vented so that there would be no contamination from the refrigerant if a leak occurred. The desuperheater accomplishes three functions. First, it typically heats 60% to 80% of a home’s hot water – for FREE utilizing waste heat from the refrigeration process. Second, it increases the efficiency of the compressor by removing some of the heat from the compressor. Third, it increases the life expectancy of the compressor by allowing it to operate at a cooler temperature. Open loop systems use water from a well. Well water is pumped to the geothermal unit, where heat is either taken from it (heating) or put into it (cooling). There is no change to the water, or contamination, other than a slight change in temperature. Generally speaking, geothermal systems require 1.5gpm per ton of air conditioning. Most homes would use between 4 and 6 gallons per minute while the system is running. This is the least expensive source for a geothermal system, and works quite well when there is sufficient water quality and quantity, and there is a place to “discharge” the water such as a drain, ditch, stream, or pond. Closed loop systems are the second most common type of geothermal source. Closed loops utilize polyethylene piping buried or drilled into the ground, filled with a water/anti-freeze solution. The loop fluid circulating in this closed piping system absorbs heat or rejects heat into the surrounding earth. Typically, in the Midwest, loop systems are installed in a “horizontal” configuration as pictured to the right. 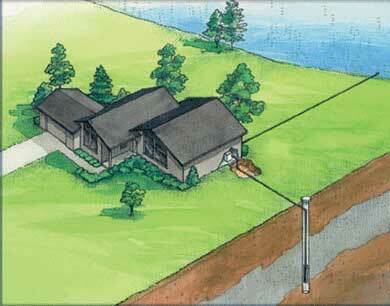 In other parts of the country, where digging is more difficult or expensive, “vertical” loops are used. Vertical loops are placed in vertical holes usually drilled in the ground with a machine similar to a drill rig used to install water wells. Vertical loops are also commonly used in commercial applications or applications where there is not enough room for a horizontal loop. Closed loops are virtually maintenance free, and since they re-circulate the same fluid, have no need for a well or a place to discharge the water. 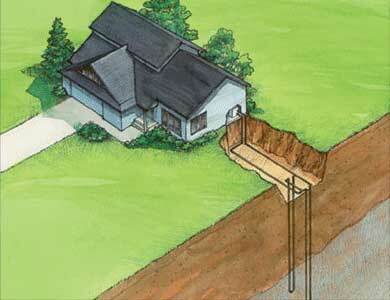 However, closed loops, due to the excavation costs, are generally more expensive than open loop systems. Pond or lake loops may indeed be the best system available. 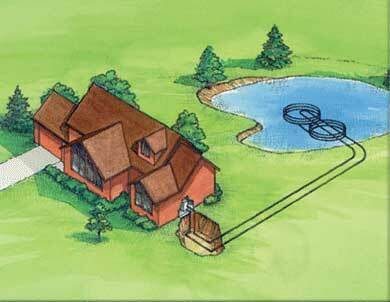 Pond loops use coils of polyethylene piping submerged into a pond or lake. They have the benefit of low installation costs in addition to the benefits of a closed loop. Also, pond and lake loops typically have more mild operating temperatures. Pond loops are also in widespread use in the commercial market due to the compact size and low initial cost compared to horizontal and vertical loops.